Australia’s second-largest pizza chain could be created if a rumoured merger between Eagle Boys and Pizza Hut eventuates. According to Fairfax Media, a Sydney-based private-equity company, Allegro Funds, is attempting to acquire both chains. Eagle Boys’ head office entered into voluntary administration in July 2016, although its franchised stores still continue to operate. It is not known if the acquisition eventuates whether Eagle Boys and Pizza Hut would be combined together under the one brand or if they would continue to operate separately as is. Allegro Funds already owns a number of businesses including carpet retailer, Carpet Court, bus manufacturer Custom and Great Southern Rail train services. The news that Allegro may be acquiring Eagle Boys and Pizza Hut comes just after Roy Morgan Research released data showing that between 2012 and 2016 that Eagle Boys’ visitation rate fell from 852, 000 every average four-weeks, to 336, 000, a 61 per cent decrease. Pizza Hut, which is owned by Yum! Brands, also experienced a drop in visitation across this period, going from one million visitors every average four-weeks to 745, 000. At the same time, competing chain Domino’s went from 1.8 million customers every four weeks in 2012 to 2.3 million in 2016. 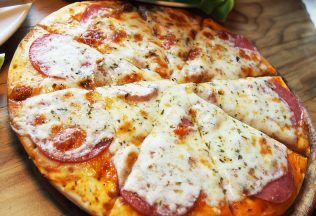 Australian Food News attempted to contact Allegro Funds, Eagle Boys and Pizza Hut for comment but did not receive any response prior to publication.